NOTES: Short run with resin parts. The Skyhawk is old enough to be considered an antique with the first plane flying in June 1954. The first two seat version, theTA-4F, took to the air in June of 1965. There are still a number of the later models still in service throughout the world, though in the US, the last ones were retired in 2003. There were generations of pilots who learned fast jet flying on the TA-4, an aircraft that not only looks sweet but was perfect for teaching advanced jet tactics and carrier landings. In its last decades the twin seat A-4 was used for Fast FAC by the Marines and as an aggressor platform. It is this last task with its myriad of interesting camouflage schemes that draws the greatest interest. The Classic Airframes kit is not the only two seat Skyhawk done in this scale. Fujimi did the aircraft in 1/50, which was later marketed as 1/48. It is best left alone as it is quite crude by even the standards of the day. Monogram later did the OA-4M and many hoped for a TA-4F/J, but it was not to happen. Converting the OA-4 into a TA-4 was possible, but the biggest problem was in the canopy area as the OA-4 had a canopy and windscreen that were not the same as the TA versions. Still, many did the considerable work to bring it back to TA-4 standards. It is a huge mystery to many of us why Hasegawa did not add a TA-4 to their line-up of Skyhawks as most of the parts are the same. CA noticed this and many of parts used in this kit look very much like they were inspired if not directly copied from the Hasegawa kit. 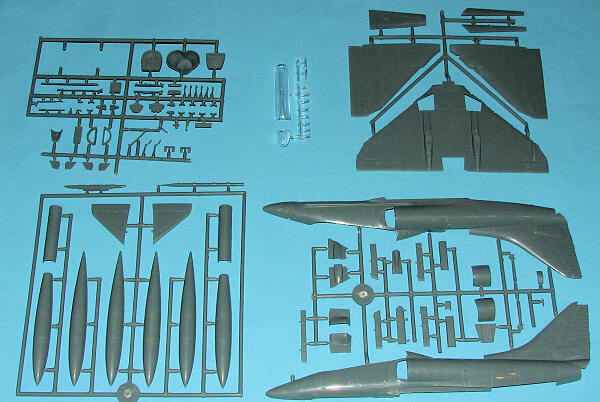 Of course, it may just be coincidence as there are only so many ways to mold an A-4. Regardless, the kit is very nicely molded by one of the Czech companies. CA farms out all of its kit requirements, only producing the box and instructions in the US. As it is a short run kit, it has some short run features. One are ejector towers inside the fuselage, intakes, wings, and the compressor intake section. Most will be easy to remove, though the depressed intake compressor section and curved intake interiors will require a bit more work. I also noticed that the sprue with the ACMI pod was slightly misaligned so care is needed not to have an oval pod. Typical of many short run kits, the sprue attachment points are rather thick. Several pieced broke away from these points during shipment, leaving gouges in some of the parts. I recommend using a micro saw to remove all of the injected plastic bits as these large sprue gates are also on the very nicely done clear bits as well. I also found sink areas on many of the thicker small parts such as the slat attachment arms. This is not unusual with these kits and all can easily be repaired. The kit has few options, mainly what is carried under the wings. You have a pair of fuel tanks with fins and a sidewinder rail for the ACMI pod. A centerline fuel tank without the fin section is also included. Skyhawks often flew without pylons and just a centerline tank or even without anything under the fuselage if the mission was short. Another option is to have the canopy open, though there is no rear hinge mechanism. 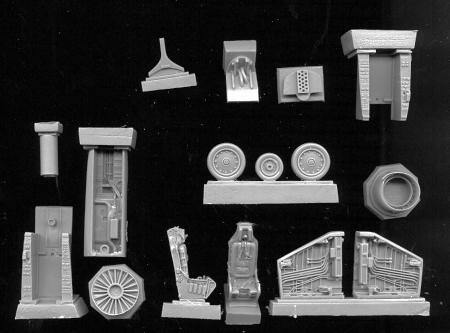 There is the usual bag of resin parts and these are superbly molded. They are what could be considered 'old school' resin with the large pour stubs. The ESCAPAC seats are especially nicely done with molded on harness and the 'head knocker' in the down position as it would be on the ground. Equally nice are the main wheel wells with tons of detailing. The cockpit is made up of several sections, one of which is the nose gear well. One of the resin bits is the exhaust cone, which on mine got ripped during shipping. I should also mention that this kit was purchased from Squadron and arrived rather crunched. The person resizing the box made it too small and when it was closed and taped, it crushed the flimsy CA box rather badly. Fortunately, damage to the kit was minimal, but it was not non-existant. It is obvious from the generic TA-4J instructions that there will be many more boxings. The sprue has open areas for the guns when one does a TA-4F and I should point out that it was not uncommon to see TA-4Js also armed. However, none of the Aggressor aircraft were and that is what this boxing is all about. 16 well drawn construction steps are provided with generic color references for wheel wells, cockpit and so on. 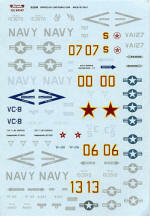 There are four decal options, all aggressors from the early/mid 1980s in various schemes. The separate markings guide does provide FS 595 paint references. First off is the box art plane from VA-127 in Dark Green, Grey and Light Brown. Next are two VF-126 aircraft. One is in Medium Blue Grey and Light Grey while the other is in Dark Green, Mediuim Green and Sand Brown with Light Grey wing undersides. Finally, from VC-8 is one in Dark Blue-Grey, Medium Glue-Gry and Light Blue-Grey. Decals are nicely printed by Cartograf in Italy. 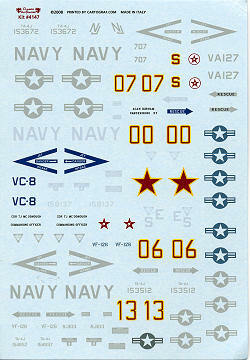 The decal numbers are missing from the sheet so an addendum sheet was added. As you can see from the image above, it was not uncommon to find aircraft with replacement slats and the paint was often retouched several times, making for interesting schemes. After years and even decades of wanting a nice 1/48 TA-4, we now have it. Sure, it will not be a slam together kit, but for those who have some experience with short run kits (or even longer run ones from some companies), there should be no major difficulties with construction. I do know that so many have been wanting this kit to appear that we'll be glad to have it until Hasegawa gets going with theirs. I'd not be surprised to see this one sell out rather quickly. I bought this one to see what it was like and thought I'd share it with you.